I’m sure everyone has their festive menu’s already sorted. Their shopping list written, deliveries planned, meat ordered and so on. Down to the last detail. So my festive might have come to late. But if you are dithering then read on (and into the remaining parts as they appear) you might find some inspiration. And for those who have everything planned out with military precision well you might find some ideas for surpluses or things to make if you can’t get what you need for your menu on your final dash to the shops. I cooked this menu last weekend when we had a pre christmas, Christmas dinner with my parents and my brother and sister in law. we’ll all be in different places with other bits of our families on Christmas Day so this was our festive get together complete with tree decorating, silly games, sherry and presents. and of course lots of food. And in the spirit of making things easy for the chef so everyone could spend time chatting rather than sweating over hot stoves lots of it was ‘cheaty’ so bought in but from top quality suppliers. And some of it was very easy to make in advance. So that’s it delicious food from good suppliers making the menu easier but still delicious. Watch out for the recipes coming soon. Autumn is well and truly here, the nights are drawing in, the weather is cooling day by day. Many of the fruits and vegetables are harvested. Those that can be have been turned into preserves of various kinds or carefully stored away to be used over the winter months. 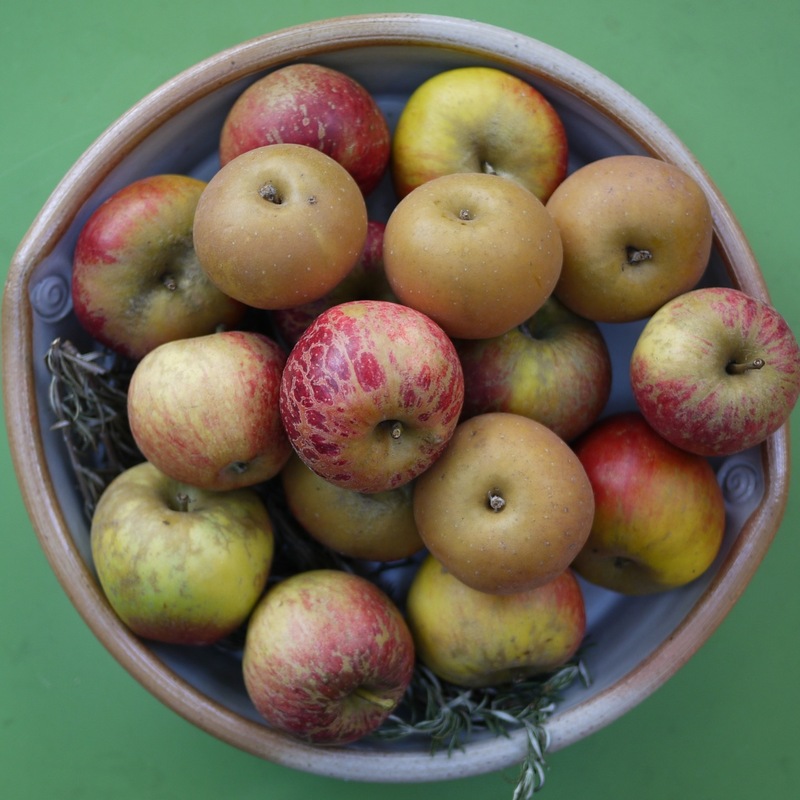 Apples are still with us and there are varieties that are still being harvested during November but the main crop has been taking place throughout October and celebrated with Apple Day events across the country. Apple Day was started 20 years ago by Common Ground to help save and celebrate the huge range of English apples that were being lost bit by bit. In that time much progress has been made and varieties that were almost lost have been reintroduced. If you care about British food though there is still plenty to be done and attending an Apple Day event can be great fun for all the family with a chance to buy apples, press your own juices or simply learn more about orchards and the variety available. If you missed out this year then put a little reminder in your diary now to seek out apple events next October, and in the meantime support the growers by searching out interesting varieties or even sponsoring a tree at a community orchard project. Of course there are plenty who don’t eat pork and they would disagree with Grigson’s statement and her subsequent analysis. But for many it has been staple of cooking for centuries and the tradition of the autumn pig slaughter and subsequent preserving is well documented. Bacon is also often cited as the meat that vegetarian converts most miss but I’m not sure there is any real data to back this claim up. For those with strong constitutions I highly recommend Jeffrey Steingarten’s essay ‘It takes a Village to Kill a Pig’, not for the faint hearted, but fascinating not least because it was first published in American Vogue, not the sort of place you imagine happening on a detailed account of traditional pig slaughter in a Basque village. Preserving meat is not something I’ve tried although there are now quite few books and courses around on preserving the bounty of the pig and I know of a number of people who make their own sausages, bacon and salami at home. I’d recommend reading Tim Hayward (of The Guardian’s Word of Mouth) articles as a good starting point. 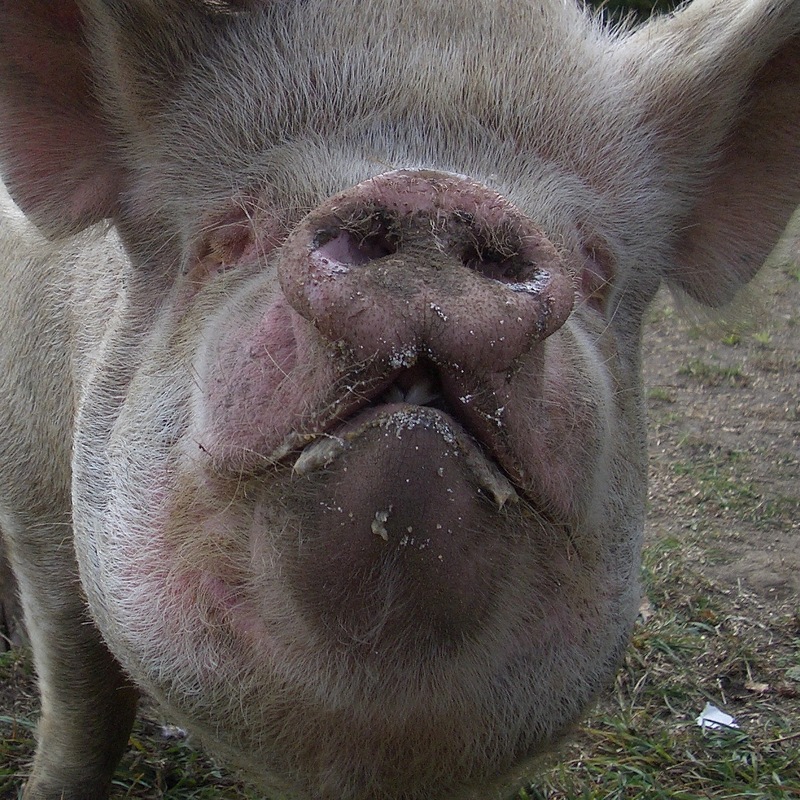 Now of course we can eat pork (and other meat) all year round if we want to. Whether it tastes its best or has been reared in a sustainable manner is of course open to much debate. It seems to make sense to eat less meat, reared in the best way possible and used sensibly. We can learn a lot from the seasons and the way people used to cook though of course we can’t go back to how they lived (and I doubt we would want to) but we can think more carefully about what we eat and when we eat it. 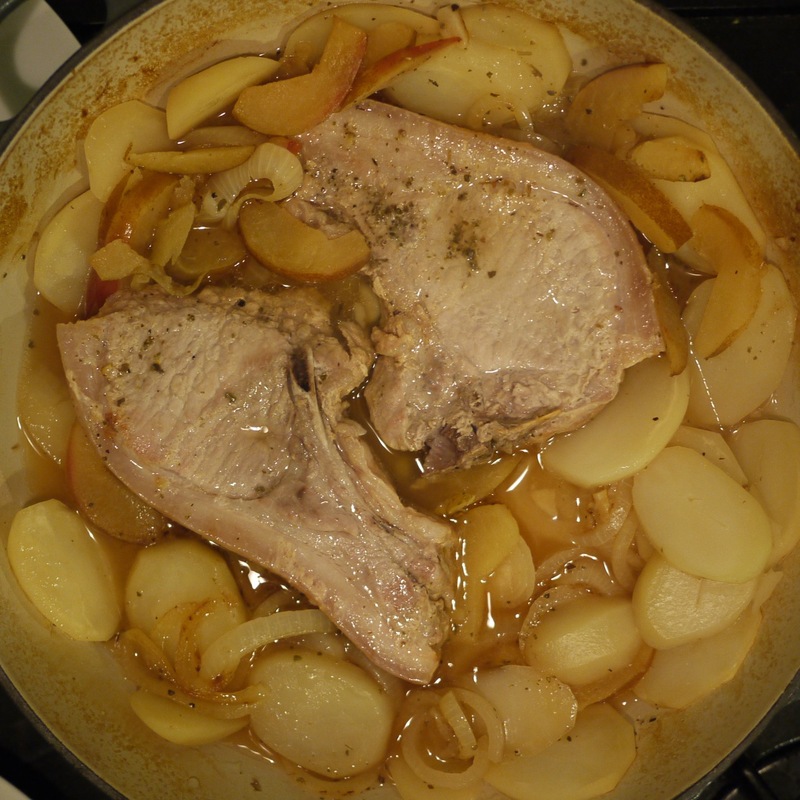 So eating pork at this time of year makes sense seasonally and pairing it with apples has a long heritage. Roast pork and apple sauce is a classic British dish with the apple sauce cutting through the sweet fattiness of the pork. That’s the point of this combination the apple provides a counterpoint to the meat, so often missed with over sweetened commercial sauces. Apple jelly is wonderful with sausages, either on the side or as a glaze to create extra sticky sausages. If you don’t have your own apple jelly to hand then try one with a little kick of chilli for some added interest (Jules & Sharpies Sage & Apple Jelly is my current favourite) track down something local to you and support a local food business. There’s a recipe I’ve been cooking for years that sprang to mind (from an early Delia Smith book) after I’d been to an Apple Day event at Copped Hall in Essex recently. I think it’s the first dish I cooked entirely on my own at home but I wanted to do it a bit differently this time and make it into an almost one-pot dish. It’s simple, pretty quick and of course tasty. Put some butter in a frying pan and brown the chops, place then in a shallow casserole dish. If needed add a little extra butter and soften the onions for about 5 minutes over a low heat, add them to the pork chops. Fry the apple slices quickly and add to the casserole. Add the cider to the frying pan and bring to simmering then pour over the chops. Sprinkle the casserole with the chopped sage and season with salt and pepper. Add the potato slices pushing them down into the creamy liquid. Cover and cook for 20 minutes then remove the lid and cook for a further 20 minutes. The chops will be cooked but remain juicy, the potatoes will have absorbed some of the creamy liquid and cooked rather like daupinoise. 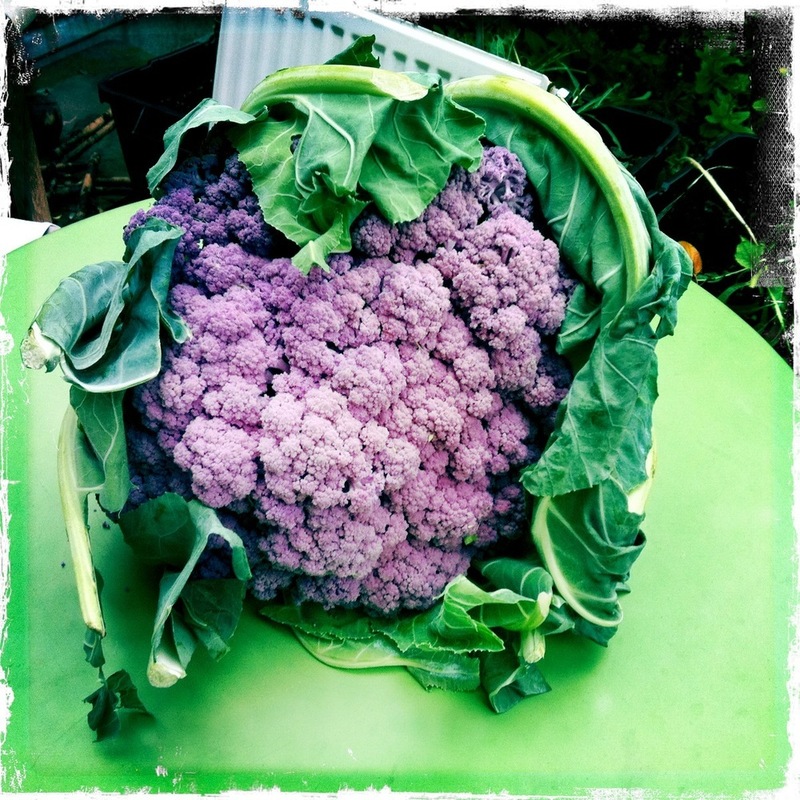 Serve with a lightly steamed autumn vegetable to balance the creaminess, we had red cabbage. When the Beyond Baked Beans team asked if I’d do a recipe that would appeal to students for their blog I was pleased but stumped. It’s a long time since I was a student and I was lucky (or unlucky) enough to get through Uni without having to cook much more than the odd slice of cheese on toast and the very occasional chilli. This isn’t because I lived at home rather its because I lived in college all three years and the college catering seemed to be modelling itself on a pretty reasonable hotel. And then each time I came up with an idea another faster more organised blogger had pipped me to the post. 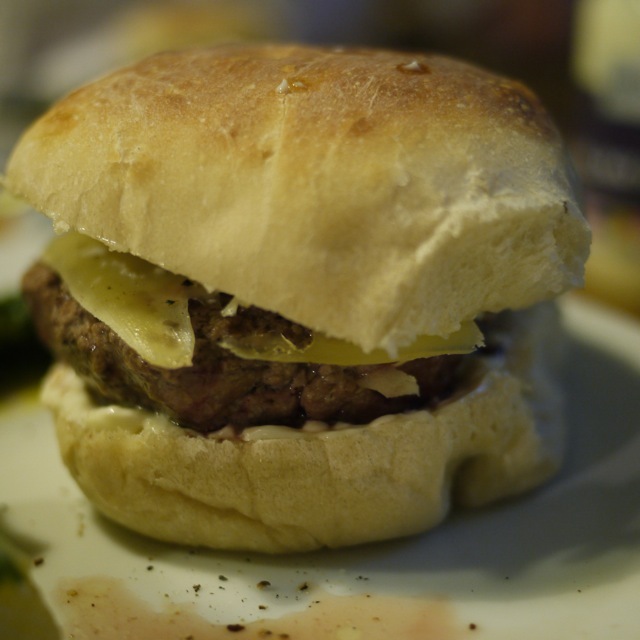 And so it is that I thought of burgers, something so easy to make I’d almost missed it….here’s the post I did for Beyond Baked Beans so that you too, as well as all those lucky students, can create your own delicious burgers. Everyone loves burgers (well everyone who loves meat). Homemade ones are brilliant, once you’ve tried them you’ll never want to buy ready made again, because there is no point. They are really simple to make and they taste so much better. You can mince the meat yourself but I’m guessing if you have a mincer you probably don’t need me to tell you about making your own burgers…. You should allow between 150g-250g of meat per person depending on whether you like small, medium or really quite large burgers. I find that 3 burgers from 500g is about right if you’ve got toppings and side dishes. Its also important that you go for the 20% fat mince, less fat and your burger just won’t be as juicy and tasty, burgers are not the place to be exercising fat content control. Get the best mince you can find it does make a real difference to the taste. This is a kind of design your own burger recipe….. Break the mince up in a bowl, add salt and pepper and mix in. You can leave your burgers plain but I like to add some spices or herbs: add your herb/spice of choice, mix in and leave for 30mins to 1 hour for the flavours to mingle and then form the meat into three equal patties with your hands. You just need to squash and shape it and it will hold together fine. Aim for about 2cm thick and don’t worry if its not perfectly flat. Pour some cooking oil onto a plate and coat each burger with oil by putting it on the plate and moving it about a bit on each side (don’t worry about the edges, just the flat surfaces). Heat your chosen pan, a griddle plan will give you nice seared lines but a frying pan is fine. You don’t need any oil in the pan as you’ve already oiled the burger. When the pan is nice and hot put the burgers in. Turn the heat down about ¼ – ½ way. Leave the burgers alone to cook. After about 2-3 minutes they will be ready to flip and they will come away from the pan easily. Turn them over and leave again. This will give you medium-rare/medium burgers; cook for longer if you wish. Serve on the buns with the condiments and side dishes of your choice. Think about how different cuisines spice their food and you’ll find plenty more options. 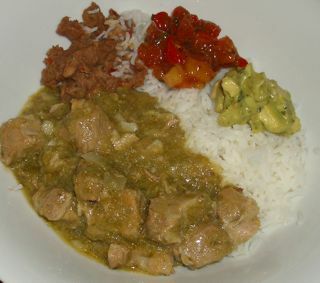 Can I cook Chile Verde? And can Karen cook asparagus tart? It’s a kind of recipes at dawn this, Chile Verde vs. asparagus tart, one blogger pitched against another. Masterchef without the cameras, or the publicity, or the random commentary, or the…….well almost any of it. Just a bit of fun. You might remember back in early May I was ‘adopted’ by Karen over at ‘Karen Cooks’. We did a blogo-interview of each other to introduce our very different worlds and in the meantime I’ve been asking Karen lots of questions about food and blogging and incorporating things I’m learning into my blog. Anyway, we thought it might be fun to have a cook-off: each pick a recipe from the others blog that would be a bit challenging and new and then cook and blog it. We agreed that we mustn’t pick something too easy but also we aren’t to email back and forth to ask for guidance if we get stuck, we’ve got to make our own judgements on how to substitute things. No winner, no loser just some fun. 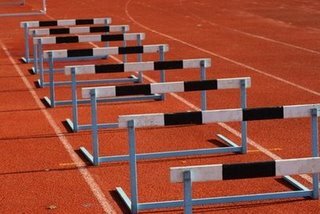 But as soon as you start to think about it there’s lots of hurdles and tests. Can you get all the ingredients? On the face of it I might have an advantage here: I’m in London, population 7.55M, over 300 languages spoken and with 40% of the population from a non British background there’s a huge variety of influences and lots of shops selling all sorts of things from around the world (hopefully Chile Verde ingredients!). 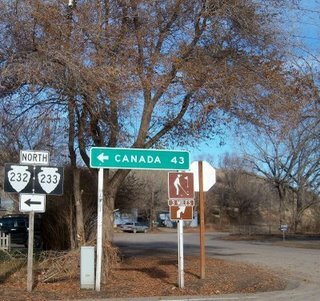 Karen meantime is in Havre, Montana, population just under 10,000 so maybe the food supplies will be more limited, or maybe not. I can see she’s tried lutefisk at the local church dinner so they aren’t short on interesting dishes/ingredients. Do you even have an idea what the dish should taste like? Um no, in my case I don’t. I’ve picked it because Karen describes it as her second favourite Mexican dish ever and also she says that it’s so good you’ll taste it and think you’ve gone to heaven (well in fact the Imperial Valley in Southern California). Actually, come to think of it, I don’t even know anything about the Imperial Valley so how do I know I want to be transported there…..
And can you actually follow some one else’s instructions? Especially if you have to start to free form if you can’t find all the ingredients…. We’ll see, let the cook off commence! 10 tomatillos – I’ve heard of these so surely they can’t be that hard to find….can they? I’ve no idea what they taste like and the web’s not much help. Mainly the consensus is sour tomatoes but then someone goes and says then can be quite mild and sweet. Helpful. 5lbs of boneless pork shoulder – ha easy! 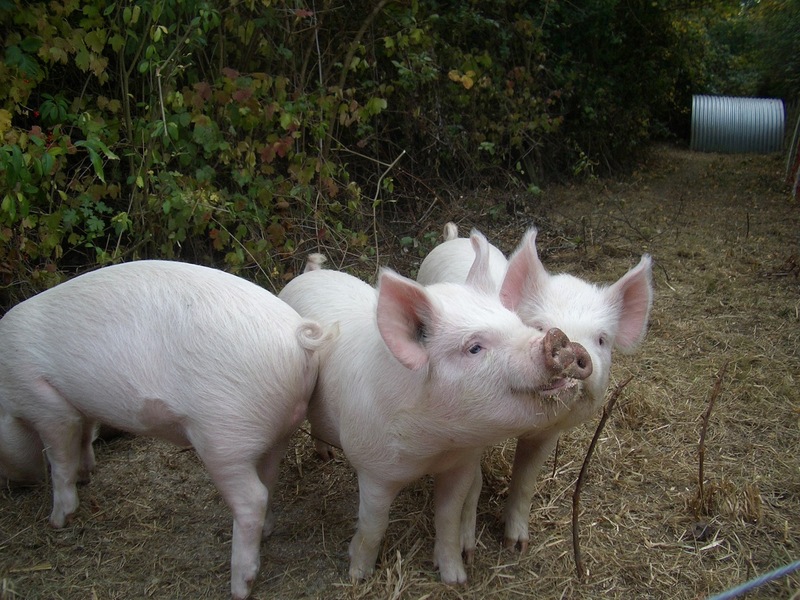 Britain is a veritable pork farm especially in nearby Suffolk and Norfolk. But hey 5lb (2.25kg) of pork! How many are we cooking for? Oh, right, Karen doesn’t say – maybe she had people coming over that day, or maybe it’s a great ‘make loads freeze it’ thing, but still, 5lb is a LOT of pork. Maybe we’ll scale back a bit on this. I mean imagine if we find that, for us, the Imperial Valley is more like hell and we don’t fancy a return trip, there’s now way I would want to end up with 10 portions languishing in the freezer. 2 tbsp of olive oil – at least I’m assuming that what Karen means by ‘2 T’ – anyway olive oil, yup, we’ve got plenty of that to hand. 1 tbsp chicken bouillon – again Karen says ‘1 T’ and she doesn’t say whether its powdered liquid or whatever. Well I’ve got cubes so they’ll do. 5 cloves garlic peeled –that’s nice and simple. 1 onion, coarsely chopped – another easy bit. 2 large jalapenos, stemmed and seeded – yeah easy, I’m sure I’ve seen them in the supermarket. 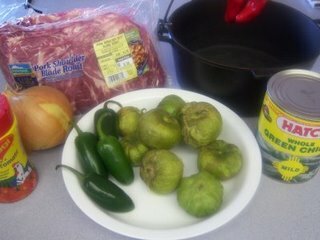 7oz can whole green chiles – hmmm can this one be hard, maybe, what exactly are green chiles? This will call for a bit of checking I think. 2 corn tortillas – ooo another easy bit the supermarket definitely has Mr ‘Old El Paso’ corn tortillas (Karen does kindly confirm my one question that its soft tortilla I need not nacho thingies). So next it’s onto the internet to find out where to get my mitts on tomatillos and green chiles. A bit of rummaging tells me that green chiles are Anaheim chiles and you can get them fresh and canned, well you can, but there’s no fresh ones right now in the UK as its too early in the season. And cans don’t seem to be that easy to come by either. Ok so lets look for tomatillos. Again you can get them fresh but its way too early, they won’t be ready until at least late June and we’ve set a deadline of 16 June to post. There’s tins as well and I find that Cool Chile Co stock these and they have a stall at Borough Market – great its been ages since I’ve done a trip to Borough so that’ll be some fun AND I can go via there on my way to meet a friend for lunch AND Cool Chile do corn tortillas so I can pick up some of those. Close to be being sorted I sit back and relax and do other stuff. How foolish of me! On my next trip to the supermarket I check for fresh jalapenos and also look, in the somewhat small Mexican section, for green chiles. None of the latter and no fresh jalapenos either – had I imagined them in the past? There’s sliced pickled ones mind, so I might have to substitute with them. But its okay. 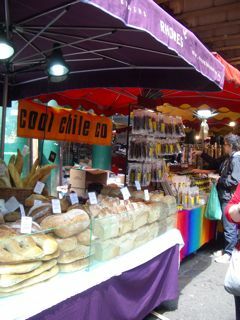 I’m going to Cool Chile at Borough market on 11 June and I’ll be able to make up lost ground. Yes. Well. That would be the case if the lovely RMT didn’t decide to call a 48 hour tube strike meaning its madness to go into central London unless you have to – is a can of tomatillos a ‘have to’ trip? Probably not, and as I’m in London on Friday (and the strike will be over) I might be able to pop by Borough then. No wrong again. I have to be somewhere before Borough opens (why does it only open at midday!) and there’s not going to be time to get there afterwards. It’s getting rather close to the deadline. In a bit of a panic I do some extra research on Karen’s site and come up with an alternative choice of Portuguese Chicken and Rice, only then I find this needs Old Bay Seasoning – okay like I’m not going to get that in time but I do find a couple of mix your own recipes if all else fails. My husband is now set on the idea of Chile Verde, however, and shuffles our Saturday plan around then packs me off to Borough to try to get tomatillos. 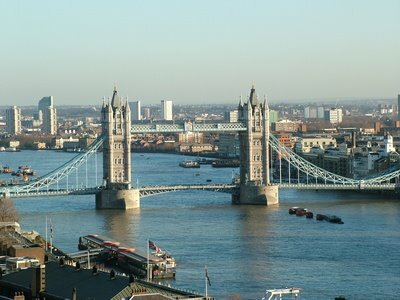 The tube journey is amazingly fast for once and from Monument it’s just a walk over London Bridge. Well just a walk through the thronging crowds of Euro tourists admiring Tower Bridge who’ve presumably come to take advantage of the exchange rate (and not just the views). I’m glad they are helping the battered British economy (and boy does it need some help right now) and they all seem to be having a lovely time in the sun admiring the views up and down the Thames, but I’d kind of prefer it they were splashing their Euros just slightly off my direct route to tomatillo buying. You can’t have it all ways so I do my helpful deed of the day when a couple of Irish lads ask if they are near Oxford Street and, having broken the bad news that they are way off target, I point them back in the right direction (like back on to the tube with very specific instructions). Eventually I get to the market and plunge in through the nearest entrance, which, somewhat amazingly, brings me in pretty close to Cool Chile, and woo hoo they have tinned tomatillos. Ah, on closer inspection they prove to be giant catering tins containing 2.9kg (6lb 6oz) of whole tomatillos! Um, that’s a few more than I need. The lady says nope there are no smaller tins, they used to get them but can’t seem to anymore, they freeze well though. Right. I’ve never tasted them. I might not like them. I’ll have enough to feed a Mexican family for, well who knows how long. 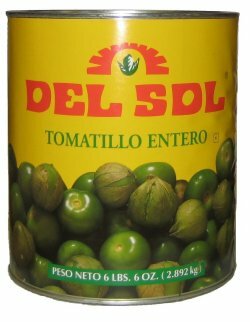 After some discussion we agree that I will cheat using the tomatillo salsa, it’s a normal size jar, its got a few other things in it, but it makes more sense and I won’t end up with stretched arms carrying it home. I also find that they don’t do tinned green chiles but I am able to get the tortillas and some whole pickled jalapenos. Mission kind of accomplished I decide it’ll be nice to wander round the rest of the market and may be have a coffee from the wonderful Monmouth Coffee Store. About 2 seconds later I realise it can only have been the high of finding something that is vaguely tomatillo-y that made me think this. This market is PACKED with people ambling so slowly they are almost in reverse and there’s a queue at Monmouth coffee that is frankly, even if this ranks as one of London’s best coffees (and it does), more than any sane person could take. I make my exit and tube it home to a coffee there. Next stop is the supermarket and pork shoulder; drat all the pieces are rolled and ready stuffed, Sunday roast style, with apple and sage – how annoying! I spy some cut as kind of chops with no extra adornments and get those, another search (thats 3 laps of the relevant sections) but no green chiles to be found at all so I go for green bell peppers and I’ll load the jalapenos a bit to balance things out. I spy a bottle of Mexican red wine (!) and decide that will be fun (or hangover material) and grab some of that. Back home it’s time to get a move on and start cooking. I’ve got 750g of meat (so 1/3 of Karen’s recipe). It’s hard to tell from her measures how much 10 tomatillos is so I just decide to use all the jar of salsa, 3 green peppers, 1.5 jalapenos, 3 cloves of garlic, half a small onion and 1 chicken bouillon square which I whizz together in the food processor to make the sauce. 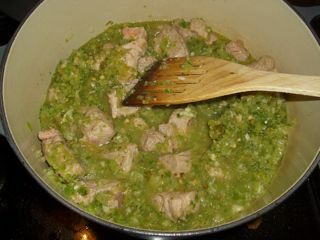 I cube the pork and cook it in oil to seal it (I do it in two batches, its easier) then in goes the sauce, stir it all round, bring it to the boil, turn down and simmer for four hours. Right now its just coming up to the 2 hour mark….so I’ll be back in while to tell you about progress. Bringing it up to simmer for 4 hours! With 30 minutes to go I’ve popped in the rest of the onion and the chopped up tortilla. I’m musing on what accompaniments to serve. The smell is pretty good so I’m hopeful it’s going to be a hit of a dish. We served it with rice, guacamole, tomato salsa and refried beans – who knows whether that’s what you have it with but that’s what we chose. It was fairly hot, but I’m a bit of a chile wimp. I thought it was going to build up to something that had me mopping by brow with a tea towel but it didn’t, staying tingly but with the tartness of the sauce cutting through the heat to make it a really refreshing dish. 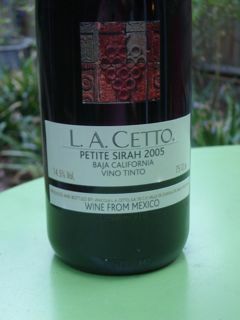 The Mexican wine was pretty good too, big flavours and fruity. So overall a 9/10. It was delicious ? and in fact I’m regretting not getting the catering can of tomatillos after all because this is a definite big addition to my cooking. 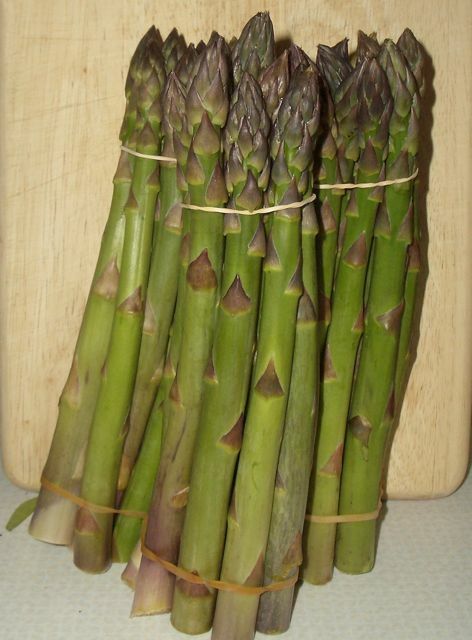 Wonder how Karen’s doing with the asparagus tart…..